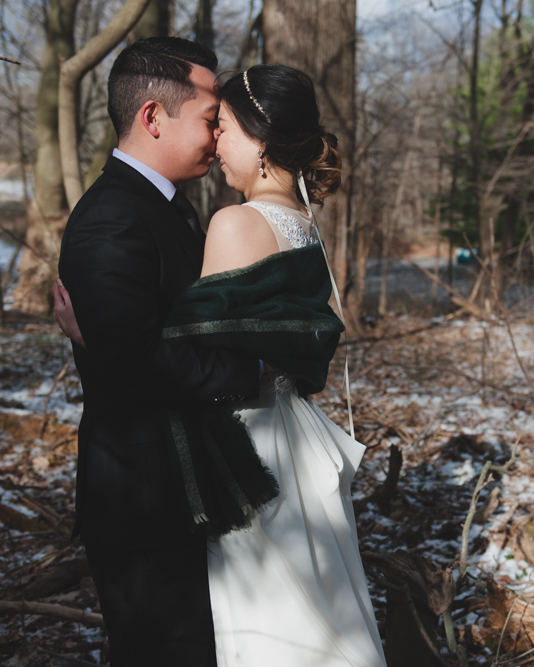 Today I'm here on the blog sharing Eugene and Celina's Elopement at Ridley Creek State Park two Sundays ago, March 12th, 2017. Physically, the day was really, really cold- We were just a couple of days out from our largest snowfall of the season and I don't think the temperature got above 35 degrees all day. 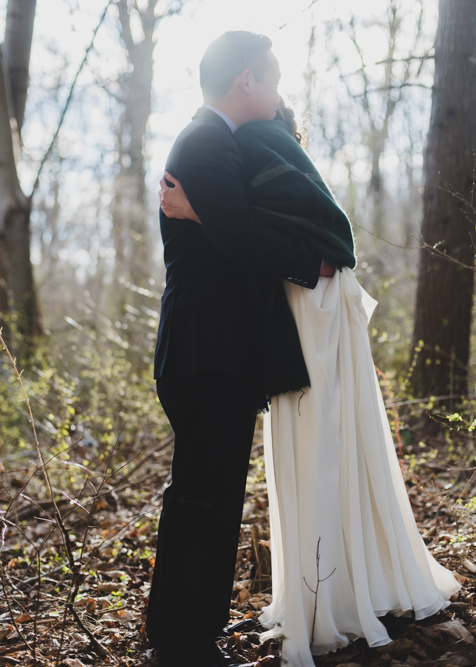 Emotionally however, the day was the warmest, sweetest day - To be the only witness to a wedding aside from the officiant is pretty special. To be there for Eugene and Celina felt right- it was the only place in the world that I wanted to be. Celina and Eugene had originally planned to be married September 3rd 2017. 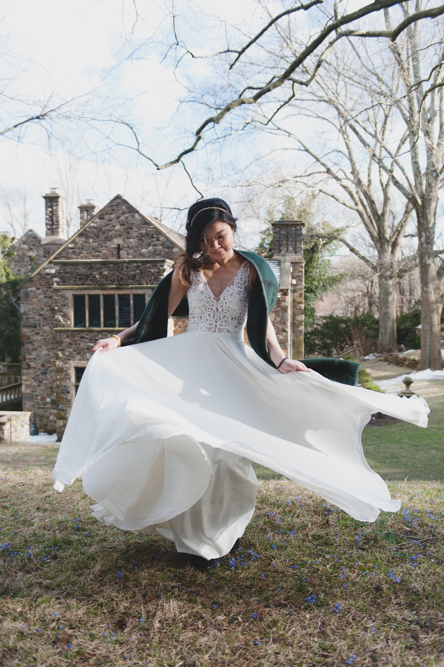 They had planned on a wedding at an Estate, surrounded by their family and friends. I had met with them originally last spring, and I fell in love with them immediately. Celina excitedly talks to you about everything; her zest for life is one of the most infectiously beautiful forces on the planet, of this I'm sure. She loves life, and she lets you know, and she lives it every moment. Eugene, who is more quiet, is a grounding, calming force in Celina's life that is so purely balancing. They are a yin- yang power couple! When I did their engagement session we had included their precious fur baby bunnies. They are so cute! About three weeks ago Celina reached out to me to let me know that she was sick, that she had been diagnosed with Lymphoma, a cancer of the Lymphatic system. After having pain in her hip for almost a year, and seeing physical therapists and chiropractors, she was finally referred to have an MRI that revealed a tumor in Celina's back. She was then diagnosed with Lymphoma, and immediately met with doctors in the city whom immediately came up with a plan to attack Celina's cancer. Eugene became steadying guide, her rock through this. Planning a wedding just didn't seem so important anymore. All the planning that had already been done, all the energy that was left to do...seemed better suited to getting Celina better. Celina and Eugene together decided that they wanted to go through this together a married couple. When they called me together, as Celina's voice broke, Eugene's became steady. While this news felt overwhelming at first, I was calmed by the two of them. 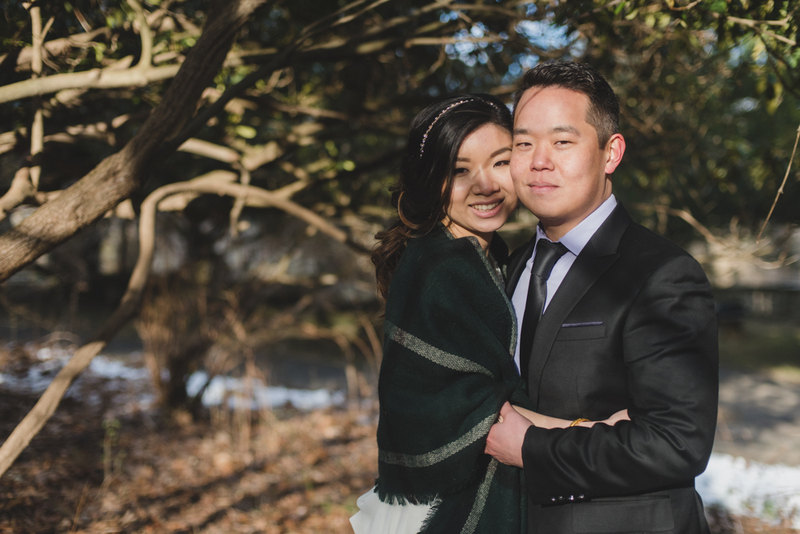 They asked me if I would photograph their wedding on the next weekend, at the park where we all gathered for the engagement session 6 months prior. There was no place I would rather be. On the day of the their wedding, I woke up early. I dressed quietly, walked the dog, and made a pot of coffee. The sky played games of cloudy, then sunny, then cloudy again. I make notes of skies on wedding days. As I arrived at Celina and Eugene's home, Celina excitedly greeted me. She looked beautiful and bright. She was excited and happy. In my hands I held a gift. A framed illustration made my wonderful artist friend Caitlin; that along with a beautiful hydrangea paper flower. I put them on the table for her and Eugene to open later. Celina and I headed to the Philly so she could have her hair and makeup done. Amazingly, Celina's vendors that she had chosen for September date, her dress, her makeup, her officiant, and myself all were able to be there for Celina and Eugene to make their Elopement feel just as special. We headed to Aleksandra Ambrozy makeup and hair. On the way to the salon, and on the way back, we chatted about everything- marriage, weddings, cancer, strength. She told me that she is looking at cancer like a gift of sorts. Cancer has helped restore her faith in the goodness of people. She said that she's seen this goodness in her doctors, in her friends, in her family. 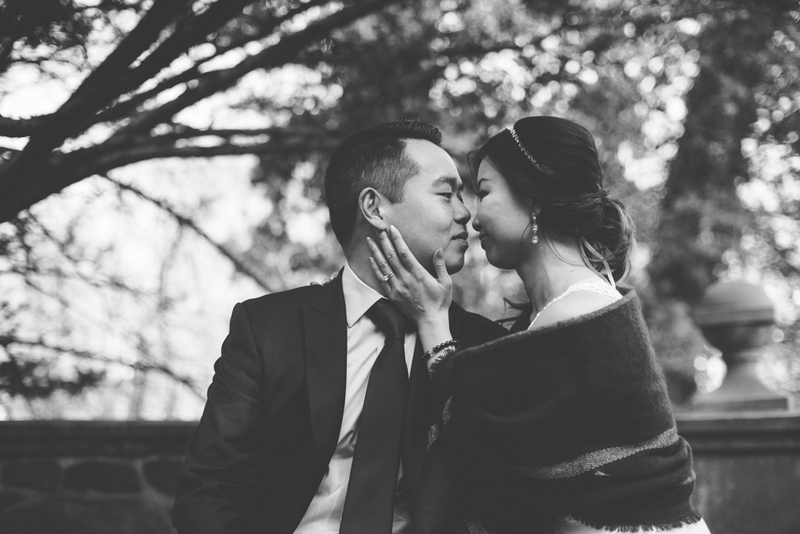 She said that everyone that she called to help her with her elopement went above and beyond . Celina and Eugene feel blessed. She and Eugene are sure that she will beat her cancer. I know she will too. They have such amazing strength on the own, and as a couple, times it by ten. After the salon, we arrived back at Celina and Eugene's home, where Celina dressed and Eugene saw Celina for the first time as his bride to be. They brought the bunnies out in to their living room where they hopped around for a bit while Eugene and Celina sat andwe talked. They opened the gift I gave them. It all felt so alive and real. As we all walked out the door, we double checked marriage license, vows, rings. We got in to the car and headed to the park. Celina and Eugene got married about 4:15 pm . It was freezing and we were all shaking and we were all crying. Crying does not make photography hard, in fact I find it more the reason to click harder and faster. Can each tear stream match the collection of memories? I hope so. To Celina and Eugene: I love you guys. You are love. You are passion and friendship and beauty and care. I am a different person than I was two weeks ago, and it's a good change. Thank you for blessing me with the gift that is the two of you. I wish you all the health and love that's inside of my heart.